Question: Can you get a liquid to change color simply by pouring it into another container? Why does the liquid change color when we pour it from one container to another? Hypothesis: The liquid will change color depending on the pH of the solution. If we add an acidic liquid it will turn pink. If we add a basic liquid it will turn blue or green. Never drink any of our liquids. They can be poisonous. Put on your safety goggles in case of splashes. Put on your gloves so you can handle the chemicals. Put 25 drops of universal indicator into the first flask, and then add 200ml of water. In the second flask, put a pipet-full of vinegar. Put 100ml of vinegar in the fourth flask. Slowly pour the contents of the first flask into the second one, then the second into the third and the third into the fourth. A sink so we can flush all the liquids after every demo. We will also need to rinse the flasks out. The secret of this magic color change is pH. Chemicals with a low pH (0-6) are acidic, while those with a high pH (8-14) are basic. (A pH of 7 is neutral: neither acidic nor basic.) Universal indicator is a chemical that changes color in the presence of acids and bases from a pH of 2 to 10. Acids turn the indicator red, pink, orange, and yellow, while bases turn it green, blue, and purple. 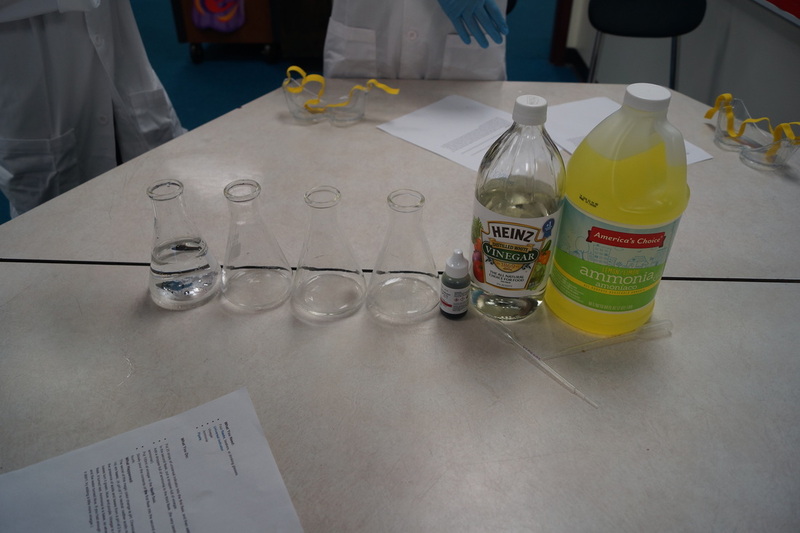 Vinegar is an acid, so when you poured the indicator solution into the second flask, it turned red. Ammonia is a base, so when you mixed the acidic vinegar solution with ammonia, it raised the pH and the water turned blue. You have to do the experiment in the correct order - acid, base, acid or it doesn't work. It was fun to see it in action. It really worked! I am a 10 year old boy in the 5th grade. Mr. Benedetto is my teacher. Social Studies is my favorite subject. I love skiing, bike riding, lacrosse and football. I also love watching science shows and Myth Busters! I have a brother and sister. I have 4 dogs and lots of chickens. I am an 11 year old boy in the 5th grade. My teacher is Mrs. Carvo. I love quad riding, snowmobiling, riding my BMX bike, lacrosse, basketball and football. I have one brother. I am an 11 year old boy in the 5th grade. My teacher is Mrs. Vita. I love quad riding, tae kwon do, lacrosse, basketball and football. I have a brother and sister. I have two dogs!